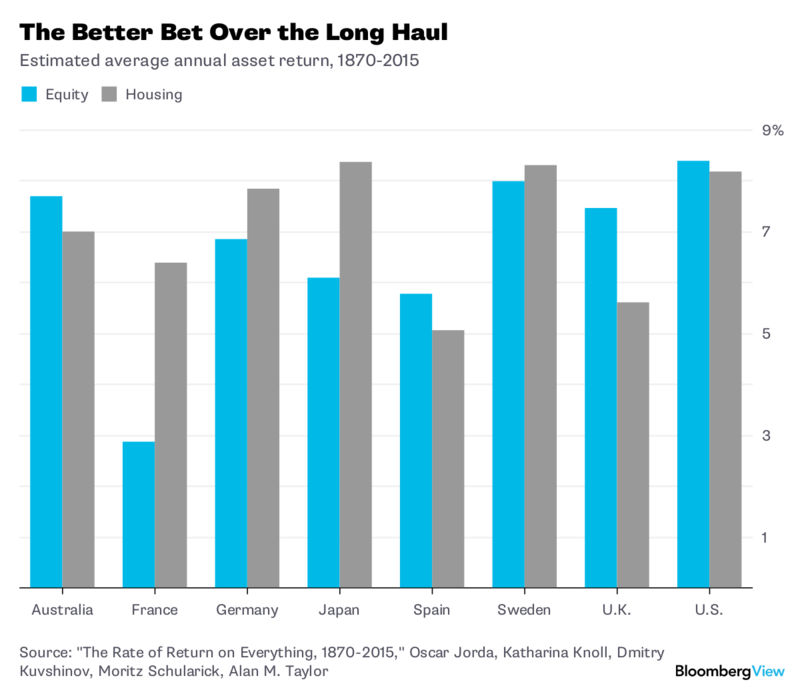 (Bloomberg View) --When most people think of wealth in the modern economy, they tend to think of stocks and bonds. The word “capital” is often synonymous with corporate ownership. Land wealth, meanwhile, is often relegated to a footnote. Yes, people own houses, but vast fortunes are made in the stock market, while the fates of nations rise and fall with the bond market. But ignoring land is a mistake. Despite the explosive growth of corporations since the Industrial Revolution, land still represents a huge percent of all the wealth in the economy. What’s more, focusing only on capital gains neglects the extremely important fact that land earns income from rent. If you live in your own house, this income is implicit -- living in your own home means you don’t have to pay rent to someone else. But if you’re a landlord, you get checks every month, just like stockholders receive quarterly dividends. And in the same way that a stockholder can use dividends to buy more shares, a landlord can use rental income to buy more property -- thus, rent needs to be counted in the return to housing. And that total return is higher than people realize. According to new research, the return on residential real estate has been as high as or higher than the return on equity. As modern economies have grown and developed, owners of the ground on which we live have been steadily enriched. In their new paper, titled “The Rate of Return on Everything, 1870-2015,” economists Oscar Jorda, Katharina Knoll, Dmitry Kuvshinov, Moritz Schularick and Alan Taylor compare stocks, bonds and housing over the past century and a half. Housing is by far the hardest asset to measure -- its price varies enormously from unit to unit and city to city, and records are hit or miss. Knoll and Schularick, together with Thomas Steger, have worked heroically to overcome these data deficiencies and create a long-term database of housing prices in advanced economies. The U.K. is one of the few countries Jorda et al. survey where stocks have significantly outperformed housing over the long run. 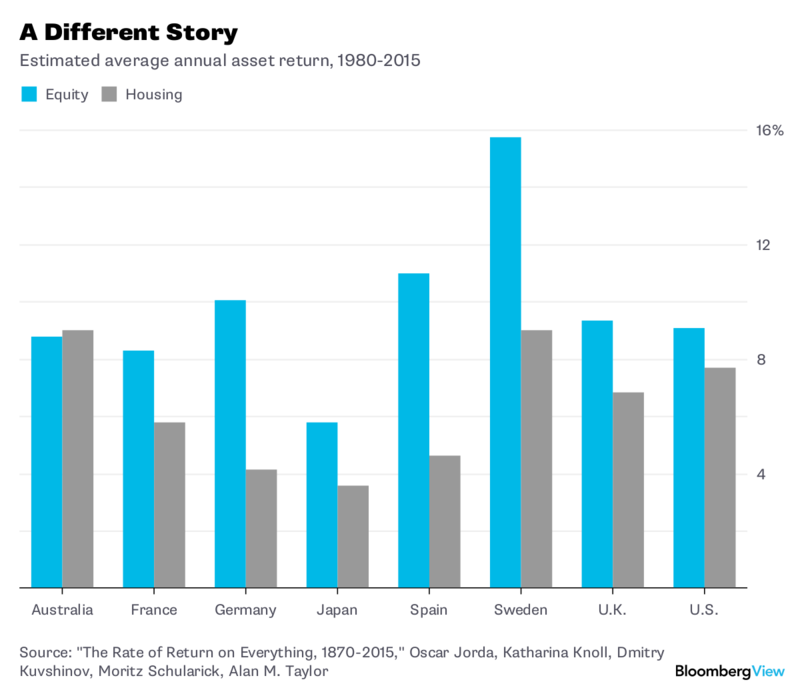 In most countries, the returns are comparable, and in some places such as France and Japan, housing has done much better. It’s much less volatile than stocks, too (though also much less liquid). Now, there are caveats to this result. Data from the 19th century is notoriously patchy and unreliable -- Knoll and Schularick have done the best they can to abstract across differences in location, quality and data gaps, but there are always assumptions involved. 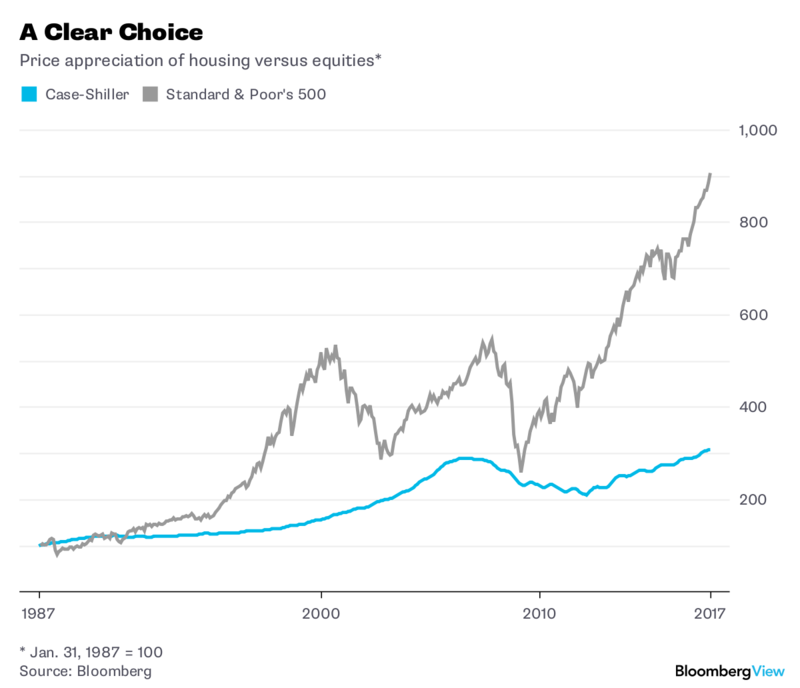 Furthermore, it’s inherently difficult to compare the return on a real asset such as housing to that of a paper asset like stocks, where price changes are easy to document. Housing also involves maintenance costs, physical depreciation, vacancy costs, the cost of searching for tenants and capital losses to things like fire, flood and war. Knoll and Schularick make good-faith attempts to account for most of these factors, but they’re working with inherently limited data -- for example, houses that burn down simply disappear from the records.